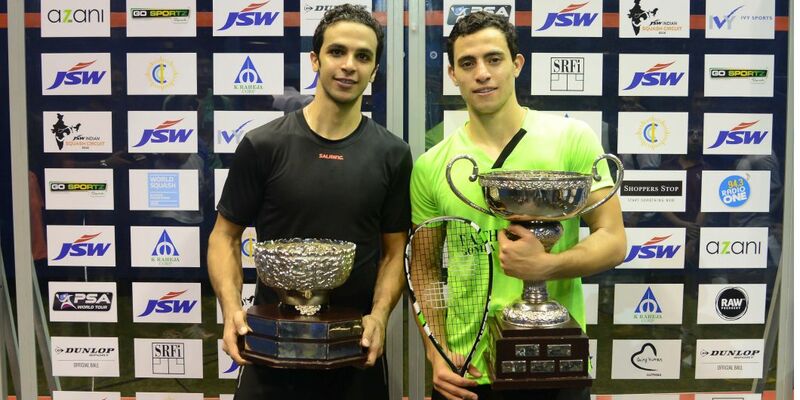 Egyptian World No.18 Fares Dessouky (right) lifted the second PSA World Tour title of his career after overcoming compatriot Mohamed Abouelghar in an exciting five-game battle in the 2016 CCI International JSW ISC, PSA M50 tournament staged at the Cricket Club of India in Mumbai. Top seed Dessouky, whose last Tour title came back in 2013, had been in fine fettle in the build-up to the final, beating Olli Tuominen, Alan Clyne and third seed Chris Simpson to set up the clash with second seed Abouelghar, who saw off Tsz Fung Yip, Mohamed Reda and Nicolas Mueller. Dessouky edged the opening game after coming out on top in some well-constructed rallies, but Abouelghar levelled in front of a packed crowd after controlling the ball well at the front of the court. The third game then saw Dessouky get back in front, taking it 11-6, only to see Abouelghar restore parity once more to send the match into a nail-biting decider. A strong start to the fifth from Dessouky saw the 22-year-old build on a 4-1 lead to close out an 11-9, 8-11, 11-6, 7-11, 11-5 victory in 70 minutes to claim a maiden PSA M50 title. Egyptian duo Fares Dessouky and Mohamed Abouelghar, seeds one and two, respectively, will face off in the final of the 2016 CCI International JSW ISC tournament in Mumbai as both players look to win their maiden PSA M50 titles. Dessouky, the World No.18, booked his final berth after coming through in straight games against England’s Chris Simpson. After a tentative start to the match, both players soon found their range, with Simpson holding a game ball at 12-11 up in the opener, only to see a tenacious Dessouky rattle of three straight winners to go ahead. The 22-year-old doubled his lead after dominating in the second game, before closing out the third to wrap up a 14-12, 11-5, 11-7 victory and move to within one win of a second career PSA World Tour title. "It was a tough match, Chris was really good," said Dessouky. "I am sure we are going to have many upcoming battles in the future. I really enjoyed playing with him today, it was a nice game." Abouelghar overcame Switzerland’s Nicolas Mueller in his semi-final fixture, with Mueller looking to follow up a surprise victory over Indian No.1 Saurav Ghosal in the previous round. The 80-minute battle with Ghosal looked to have had an effect on Mueller as Abouelghar started the stronger of the two and it was the Egyptian who held out to take it 11-7, 11-6, 11-9. "I wasn't very comfortable today because Niki is a consistent player, and if I give him any openings, he will go for it and strike," Abouelghar said. "I had to make sure that I was sharp as much as I could." Dessouky and Abouelghar are set to meet for the fourth time on the PSA World Tour, with Dessouky winning their last two fixtures. Swiss World No.34 Nicolas Mueller ended home representation in the 2016 CCI International JSW ISC event after fighting back from two games down to beat Indian No.1 Saurav Ghosal in the quarter-final stage of the PSA M50 tournament taking place in Mumbai. Ghosal, who reached the final of this tournament last year, won the pair’s only previous meeting on the PSA World Tour back in 2009, and it was the Kolkata-born World No.21 who edged the opening two games 11-9 and 14-12 to take a two-game lead at the Cricket Club of India. But a resurgent Mueller battled back from a hand injury sustained towards the end of the second game to halve the deficit in the third for the loss of two points. The 27-year-old then carried his momentum forward in the fourth and fifth games to complete a superb comeback, earning him a place in his first PSA M50 semi-final since 2012. Mueller will go head-to-head with second seed Mohamed Abouelghar for a place in the final after Abouelghar overcame fellow Egyptian Mohamed Reda by a 3-1 margin of victory. Meanwhile, top seed Fares Dessouky booked his place in the last four courtesy of a 3-1 win over Scotland’s Alan Clyne, with England’s Chris Simpson standing between him and a place in the final thanks to a victory in straight games over Frenchman Lucas Serme. 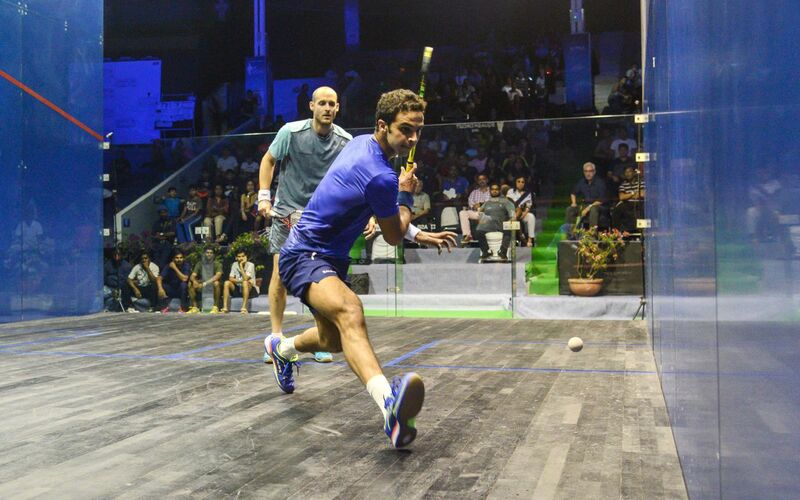 Egyptian World No.18 Fares Dessouky got his 2016 CCI International JSW ISC campaign off to a winning start as all eight seeds rose to victories on the opening day of main draw action at the PSA M50 tournament taking place in Mumbai at the Cricket Club of India. Dessouky was in fine form to shrug off the attentions of experienced Finnish campaigner Olli Tuominen, earning the win by an 11-9, 11-6, 11-7 margin to seal his place in the quarter-final stage. Scotland’s Alan Clyne will meet Dessouky for a place in the last four after he benefitted from an injury to Indian qualifier Mahesh Mangaonkar. Clyne was two games ahead and 5-3 up in the third before Mangaonkar was forced to retire after 20 minutes. Home hope Saurav Ghosal was the only Indian player to win on day one after he overturned a one-game deficit against Malaysia’s Ivan Yuen, setting up a quarter-final fixture with Switzerland’s Nicolas Mueller, who beat England’s Jaymie Haycocks. The other local player involved in the main draw was tournament wildcard Vikram Malhotra, with the World No.62 falling in four games to Egypt’s Mohamed Reda, whose reward is a next round clash with second seed Mohamed Abouelghar. England’s Chris Simpson is also through after the World No.20 defeated Campbell Grayson of New Zealand, and the number three seed will face Frenchman Lucas Serme in the next round. Indian No.1 Saurav Ghosal will be looking to go one step further when this year’s CCI International JSW ISC tournament gets underway in Mumbai on November 24, a year on after he lost out to World No.15 Borja Golan in last year’s final. The 30-year-old started the season brightly, reaching the semi-final stage of September’s Macau Open, but has struggled for form and fitness in the intervening months, with first round defeats at the NetSuite Open and, most recently, the Qatar Classic halting his attempts to break back into the world’s top 20. However, with his home fans behind him, Ghosal will once again be one of the contenders for the title this year and, with Spaniard Golan not featuring in this tournament, is likely to find Egyptian Fares Dessouky standing between him and a first PSA World Tour title in 14 months. 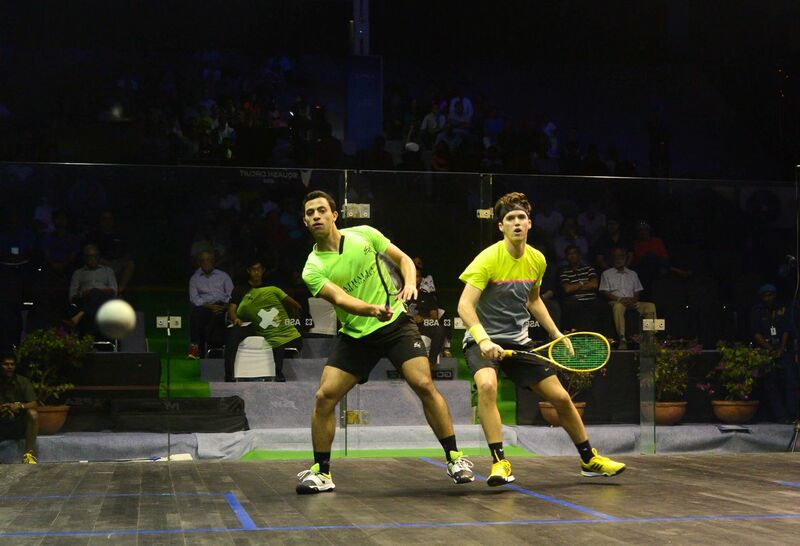 Top seed Dessouky made it to the first round of the quarter-final of the PSA Men’s World Championship earlier this month, and lines up against experienced Finnish campaigner Olli Tuominen in the first round. Dessouky’s fellow Egyptian and World No.21 Mohamed Abouelghar is this year’s number two seed, and he will look to start his own run to the final – where he is seeded to meet Dessouky – against Tsz Fung Yip of Hong Kong in round one. Alongside Ghosal, the only other players to be representing India on home turf are wildcard Vikram Malhotra and qualifier Mahesh Mangaonkar. Malhotra was born in Mumbai, but now lives and trains in Hartford, Connecticut in the Unied States. He didn’t get through the qualifying rounds last year, so will be looking to cause an upset against the third and final Egyptian at the tournament, Mohamed Reda. Mangaonkar, meanwhile, will look to cause a huge upset against Scotland’s Alan Clyne in his first round encounter – with Clyne ending Ghosal’s Qatar Classic campaign just a week previously. Englishman Chris Simpson will be looking to lead the way for the European participants when he faces Campbell Grayson in round one in what is his first appearance at the CCI International. The World No.20 is yet to win a PSA M50 title, with his last piece of silverware coming at the IG Open de Paris back in May, but is one of the favourites in Mumbai after breaking into the world’s top 20 for the first time since 2014 earlier this month. Top qualifying seed Ivan Yuen earned his place in the main draw of the 2016 CCI International JSW ISC event after defeating Egypt’s Youssef Soliman 3-0 in the final round of qualifying at the PSA M50 tournament held at the Cricket Club of India in Mumbai. The CCI International is the second tournament on the 2016 version of the Indian Squash Circuit - which has been running since 2014 - and will see a high-quality draw battle it out for a share of the $50,000 prize purse, with Yuen set to face Indian No.1 and last year’s runner-up Saurav Ghosal in the opening round of main draw action. Welshman Joel Makin also rose to victory on the final day of qualification, beating Yuen’s fellow Malaysian Addeen Idrakie to set up a first round meeting with Frenchman Lucas Serme. England’s Jaymie Haycocks and Indian No.3 Mahesh Mangaonkar were the other players to seal their places in the main draw. Haycocks overcame Jamaica’s Christopher Binnie, while Mangaonkar was given a walkover against compatriot Harinder Pal Singh Sandhu after the latter failed to recover from a back injury. Switzerland’s Nicolas Mueller will face Haycocks, with Scotland’s Alan Clyne set to meet Mangaonkar when the main draw gets under way on Thursday November 24.